Y’all this outfit, I am dying! 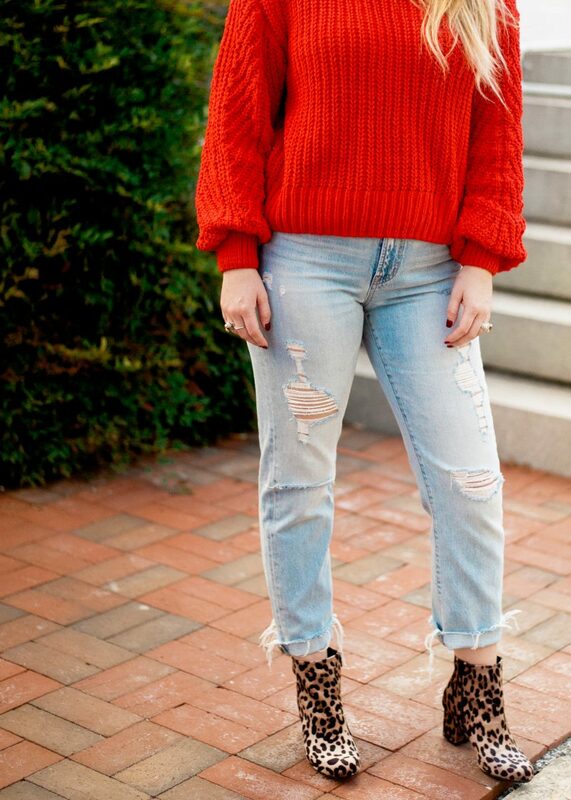 Between the sweater, the distressed denim and the statement booties, it’s the perfect fall outfit. 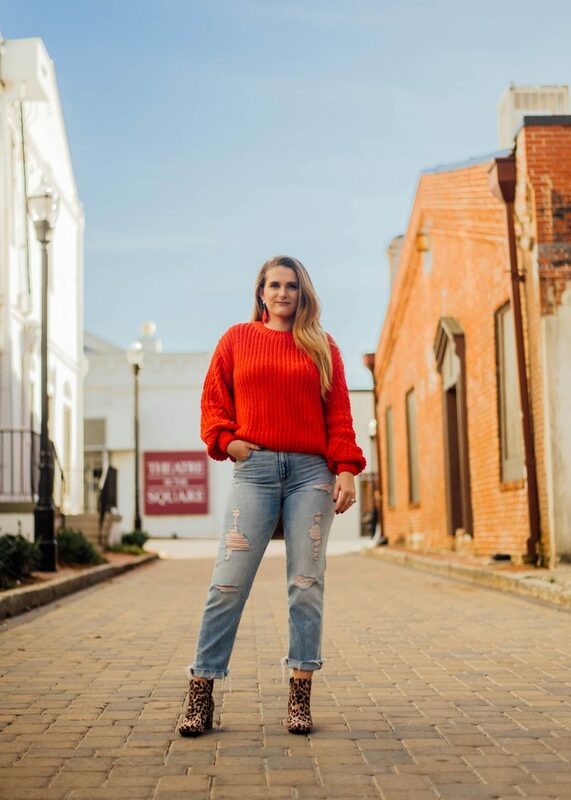 When I think fall outfit, I typically think about the neutral colors and monochromatic looks, but this season is all about the bold colors, patterns and statement pieces. 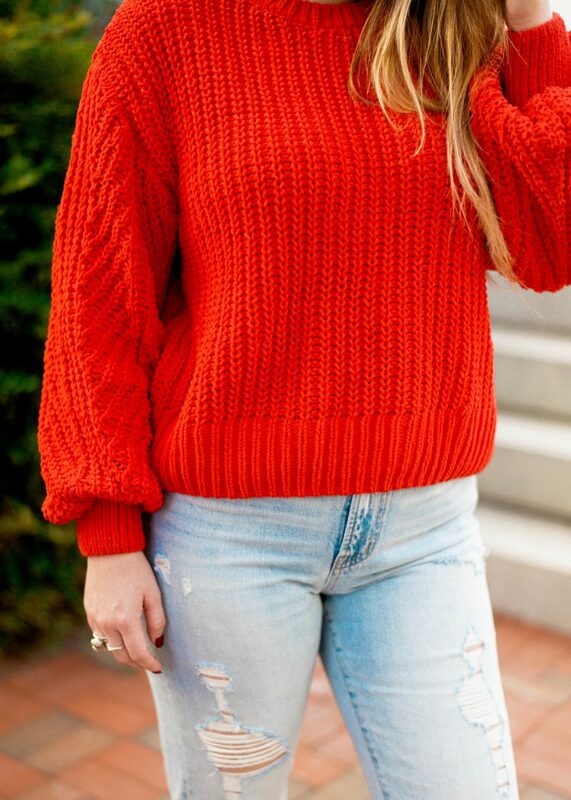 I saw this sweater online and absolutely loved it! So, I went into the store and tried it on and OMG, I had no idea how soft this thing was. It’s seriously one of my all-time favorite sweaters. 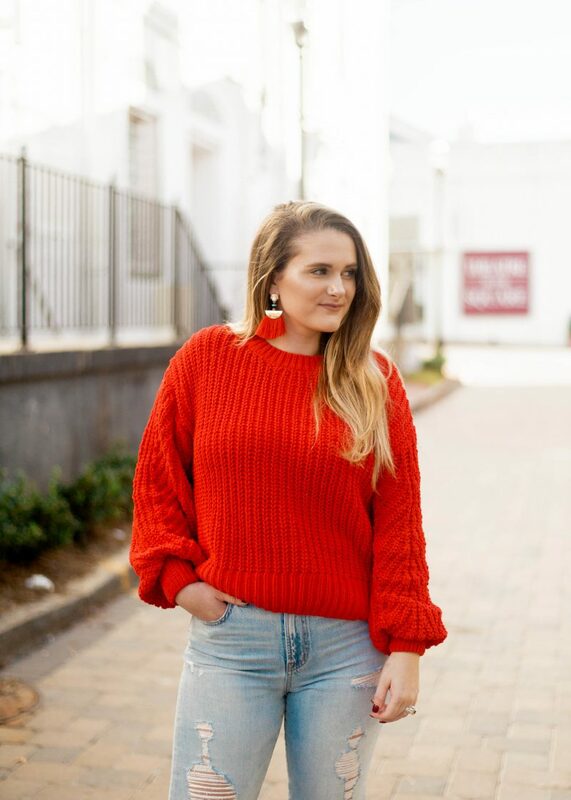 The fabric is soft and fuzzy, but since it’s a chunky knit sweater, it breathes very well, which is perfect for this crazy Georgia weather right now. 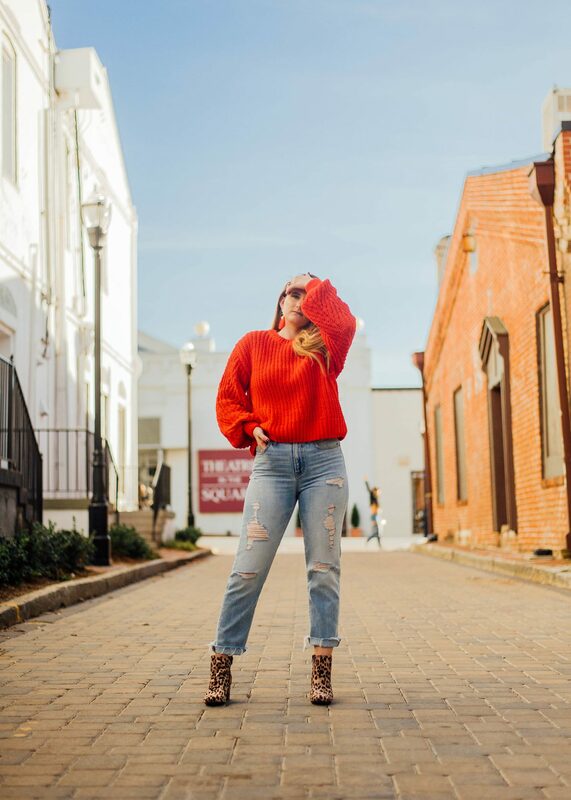 The sleeves are the trendy bell sleeves that everyone is loving, but the best part about them is the cuff because it doesn’t interfere with the things you need to do! You can’t forget about the price! When I saw it online it was $20, but when I went into the store they had a sticker over it changing the price to $15 – um, score! 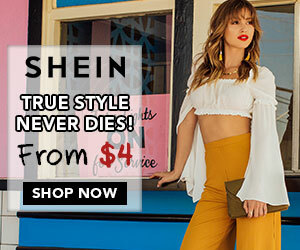 I love finding good denim on sale, which is exactly how I came across these amazing jeans! 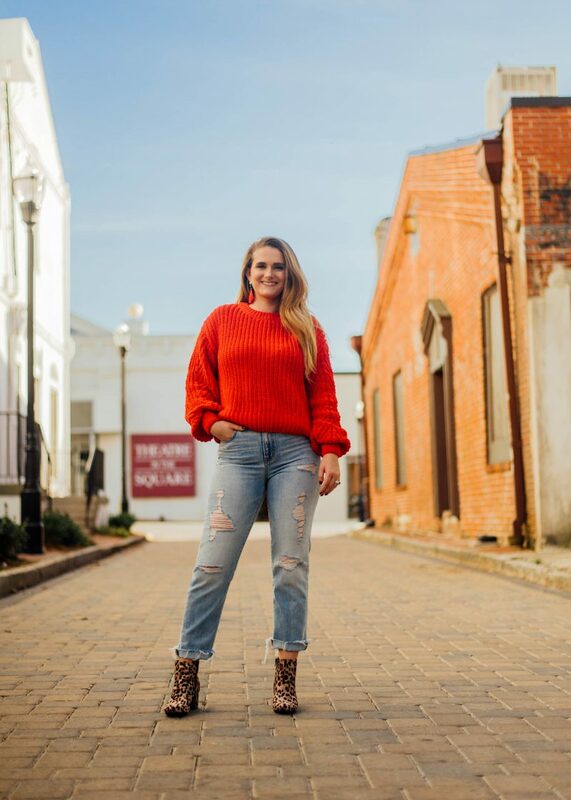 I was shopping at Madewell in Ponce City Market and found these distressed boyfriend jeans on sale for around $30, with one pair left, in my size, and I knew they were meant to go home with me! I love them because they are high-waisted, distressed, a boyfriend fit and have a raw hem. They are different from all of my other jeans but that makes me gravitate towards them even more! Unfortunately, I couldn’t find them on the Madewell site, but I linked a very similar pair from Forever 21 up above. 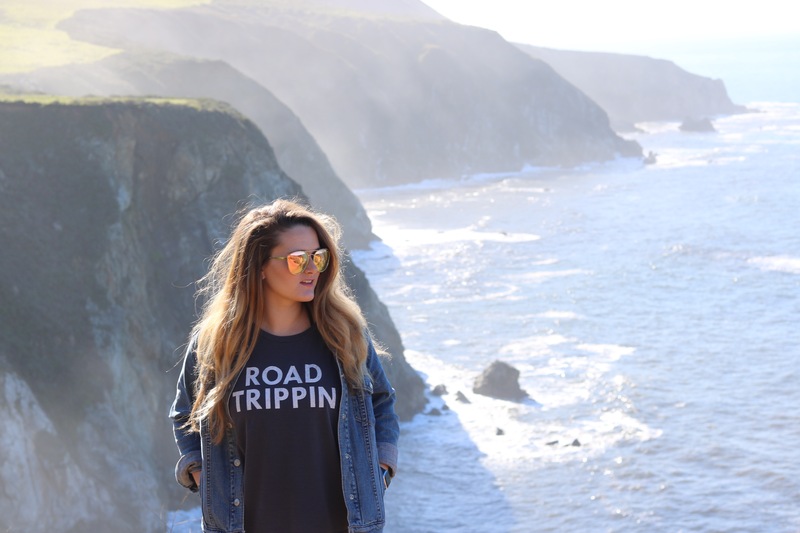 Really any pair of your favorite denim will do well with this type of outfit! When I was accessorizing this outfit, I needed some items that were fun and would stand out. Well, I think the shoes and earrings did just that. I bought these tassel earrings back in July on Amazon (my holy grail for everything) and I’ve made pretty good use of them. 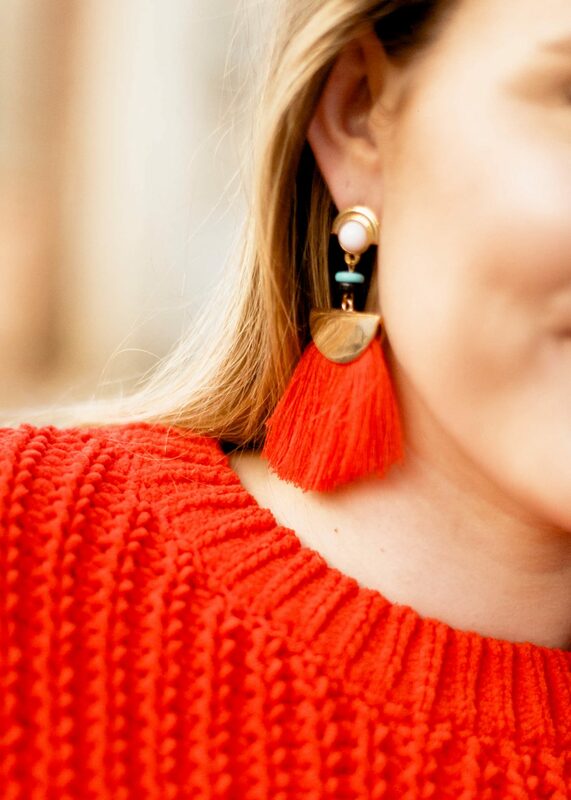 They’re perfect to throw on when you just want a pop of color! In this case, they matched my sweater perfectly but still stood out. Last, but certainly not least, these boots! 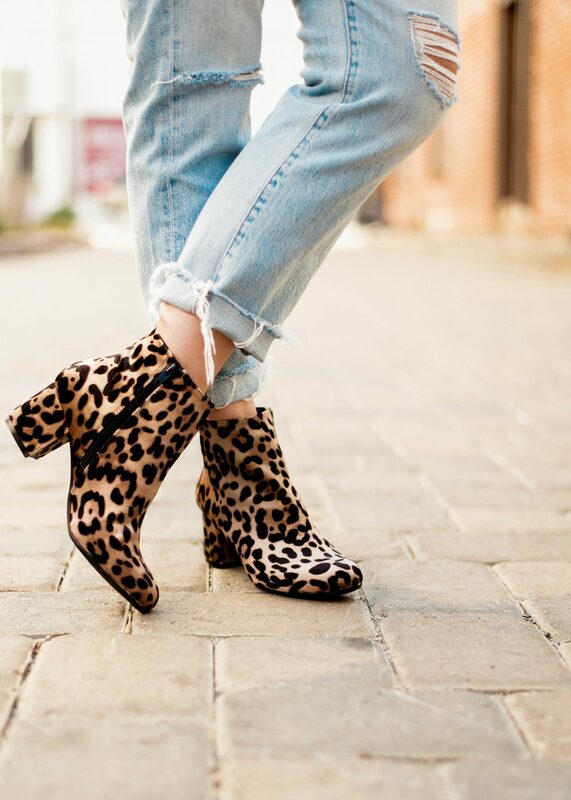 Seriously, all of the heart eyes for these boots! I had my eye on them for a while before finally pulling the trigger. I thought to myself, ‘do I need really need another pair of boots?’ No, I didn’t, but I’m glad that I waited and bought these on sale because I am in love! I have received so many compliments on them, it’s insane! They’re reasonably priced, comfortable and fit true to size. Plus, they are a dupe for all of the designer cheetah boots coming out this season. Personally, cheetah print will never go out of style, if done tastefully. 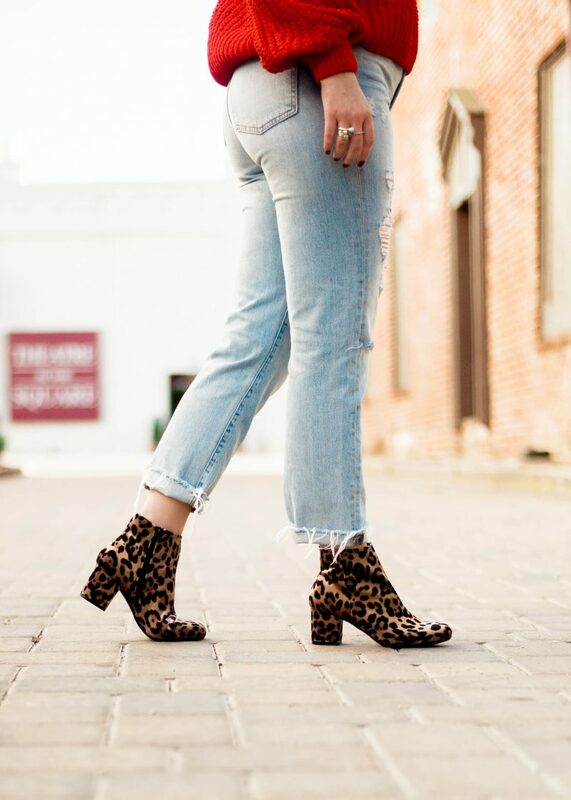 If you’ve been thinking about these boots, get them now before they sell out! I promise you won’t regret this purchase.